[by Lynne Chapman, from England, in Lanzarote] At the end of the afternoon, after a day of sightseeing, we stopped off at a lovely little place just down the coast called Punta Mujeres. 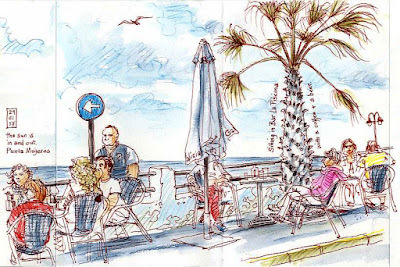 We sat outside a street café which overlooked the water, while I did a quick sketch. I experimented with a coloured line, using one of my new Graphik Line Painters (another Christmas gift from Derwent). Then I tinted it with my Inktense pencils. 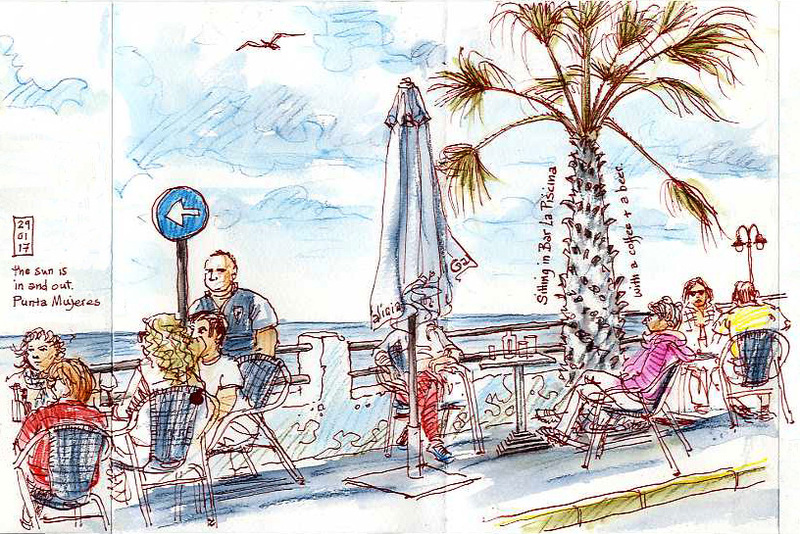 It's not the best sketch I've ever done, but it had the usual effect of introducing us to the locals. The owner got very excited and borrowed my book to show to the various punters I'd drawn. Some little girls then came over to practise their English, talking to me shyly about my sketch.